This century will show that the matter-energy conversion is only the first step in the trans-formative hierarchy. The next is the Energy-Information conversion – and maybe in 100 years they will also understand the information-consciousness conversion. Maxwell guessed the first with his “Maxwell demon” http://en.wikipedia.org/wiki/Maxwell’s_demon . But what he and most Physicists today did not see – is the obvious – that there is such a demon in all living beings – however to vastly different degrees. All Life has in common and can actually be defined by the fact that “Life processes invert the process of Entropy” which means they reduce entropy to some degree. We can see this ability to very different degrees in people – some mainly create more chaos from the energy they take in from food and sunlight and others – particularly the saints create new levels of order that continues for centuries after they die and affects the level of order in the lives of millions of people. Here are the first scientific voices that express this view. Physicists in Japan have shown experimentally that a particle can be made to do work simply by receiving information, rather than energy. They say that their demonstration, which uses a feedback system to control the electric potential of tiny polystyrene beads, does not violate the second law of thermodynamics and could in future lead to new types of microscopic devices. Maxwell’s demon hard at work? The experiment, carried out by Shoichi Toyabe of Chuo University in Tokyo and colleagues, is essentially the practical realization of a thought experiment proposed by James Clerk Maxwell in 1871. Maxwell envisaged a gas initially at uniform temperature contained in a box separated into two compartments, with a tiny intelligent being, later called “Maxwell’s demon”, controlling a shutter between the two compartments. By knowing the velocity of every molecule in the box, the demon can in principle time the opening and closing of the shutter to allow the build-up of faster molecules in one compartment and slower ones in the other. 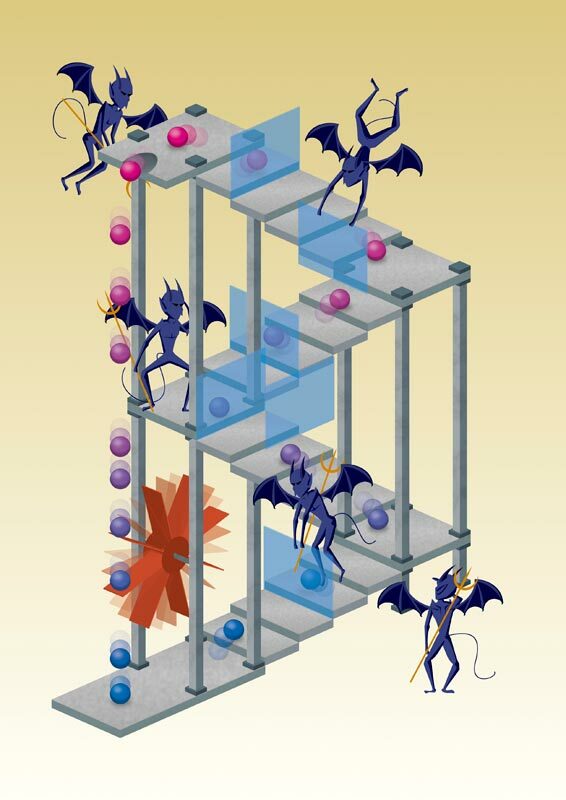 In this way, the demon can decrease the entropy inside the box without transferring energy directly to the particles, in apparent contradiction of the second law of thermodynamics. 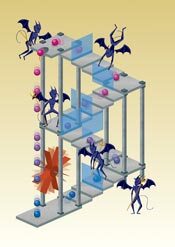 Among the many responses to this conundrum was that of Leó Szilárd in 1929, who argued that the demon must consume energy in the act of measuring the particle speeds and that this consumption will lead to a net increase in the system’s entropy. In fact, Szilárd formulated an equivalence between energy and information, calculating that kTln2 (or about 0.69 kT) is both the minimum amount of work needed to store one bit of binary information and the maximum that is liberated when this bit is erased, where k is Boltzmann’s constant and T is the temperature of the storage medium. Toyabe and colleagues have observed this energy-information equivalence by varying an electric field so that it represents a kind of spiral staircase. The difference in electrical potential between successive steps on the staircase is kT, meaning that a thermally fluctuating particle placed in the field will occasionally jump up a step but more often than not it will take a step downwards. What the researchers did was to intervene so that whenever the particle does move upwards they place the equivalent of a barrier behind it, preventing the particle from falling beyond this point. Repeating the process allows it to gradually climb the staircase. The experiment consisted of a 0.3 µm-diameter particle made up of two polystyrene beads that was pinned to a single point on the underside of the top of a glass box containing an aqueous solution. The shape of an applied electric field forced the particle to rotate in one direction or, in other words, to fall down the potential-energy staircase. Buffered by the molecules in the solution, however, the particle every so often rotated slightly in the opposite direction, allowing it to take a step upwards. By tracking the particle’s motion using a video camera and then using image-analysis software to identify when the particle had rotated against the field, the researchers were able to raise the metaphorical barrier behind it by inverting the field’s phase. In this way they could gradually raise the potential of the particle even though they had not imparted any energy to it directly. In recent years other groups have shown that collections of particles can be rearranged so as to reduce their entropy without providing them with energy directly. The breakthrough in the latest work is to have quantified the conversion of information to energy. By measuring the particle’s degree of rotation against the field, Toyabe and colleagues found that they could convert the equivalent of one bit information to 0.28 kTln2 of energy or, in other words, that they could exploit more than a quarter of the information’s energy content. Center for Science Education, Portland State University, P.O. Box 751, Portland, OR 97207, USA. Tel. (503) 805-7860; E-mail duncant@pdx.edu. Until now, demonstrating the conversion of information to energy has been elusive, but University of Tokyo physicist Masaki Sano and colleagues have succeeded in demonstrating it in a nano-scale experiment. In a paper published in Nature Physics they describe how they coaxed a Brownian particle to travel upwards on a “spiral-staircase-like” potential energy created by an electric field solely on the basis of information on its location. The team observed the particle using a high-speed camera. The particle had some thermal energy and moved in random directions. When it was moving up the staircase they allowed it to move freely, but when it moved down the staircase they blocked its movement via a virtual wall created by an electric field. The virtual wall therefore acted like a Maxwell’s demon, only allowing the particle to move in one direction, but not forcing or pushing it. As the particle traveled up the staircase it gained energy from moving to an area of higher potential, and the team was able to measure precisely how much energy had been converted from information. The experiment did not violate the second law of thermodynamics because energy was consumed in the experiment by the apparatus used, and by the experimenters themselves, who did work in monitoring the particle and adjusting the voltage, but Sano said the experiment does demonstrate that information can be used as a medium for transferring energy. The results also verified the generalized Jarzynski equation, which was formulated in 1997 by statistical chemist Christopher Jarzynski of the University of Maryland. The equation defines the amount of energy that could theoretically be converted from a unit of information.